I would like you to take a look at the following article written American Journalist “Michael Sokolove” of the New York Times in June, 2010. Though I have never been to the world famous Ajax Youth Academy (De Toekomst), I do see a lot similarities with the academies that I have visited over in Brazil. Like it or not, soccer is a business all around the world and to succeed at the highest levels, parents and kids have to make sacrifices. Thus, the difference between recreational soccer like AYSO and competitive soccer like the US Club System. I’m interested in hearing your opinions on this article. Do you feel the Dutch system is over the top? Do you feel that they are burning out their kids? My personal opinion is that I don’t have a problem with it. If you pay close attention, you will see that up until age 12 their kids only practice 3 times a week with a game on the weekend. They stress the importance of allowing kids to be kids. From 13 on, kids have to make up their minds if they want to shoot for the stars, or if they are just happy competing at the level they are at. Those that don’t embrace the sport fully will be left behind. Like it or not! 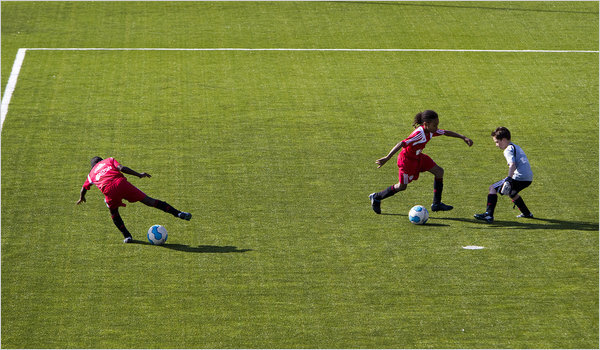 Under-10 players at work at the Ajax academy in Amsterdam. In America, with its wide-open spaces and wide-open possibilities, we celebrate the “self-made athlete,” honor effort and luck and let children seek their own course for as long as they can — even when that means living with dreams that are unattainable and always were. The Dutch live in a cramped, soggy nation made possible only because they mastered the art of redirecting water. They are engineers with creative souls, experts at systems, infrastructure and putting scant resources to their best use. The construction of soccer players is another problem to be solved, and it’s one they undertake with a characteristic lack of sentiment or illusion. The first time I visited De Toekomst happened to coincide with the arrival of 21 new players — 7- and 8-year-olds, mainly, all from Amsterdam and its vicinity — who were spotted by scouts and identified as possible future professionals. As I came upon them, they were competing in a series of four-on-four games on a small, artificial-turf field with a wall around it, like a hockey rink, so that balls heading out of bounds bounced right back into play. It was late November and cold, with a biting wind howling off the North Sea, but the boys skittered about in only their lightweight jerseys and baggy shorts. Their shots on goal were taken with surprising force, which kept the coaches who were serving as goalkeepers flinching and shielding themselves in self-defense. The whole scene had a speeded-up, almost cartoonish feel to it, but I certainly didn’t see anyone laughing. Like other professional clubs in Europe and around the world, Ajax operates something similar to a big-league baseball team’s minor-league system — but one that reaches into early childhood. De Jong, a solidly built former amateur player, is one of some 60 volunteer scouts who fan out on weekends to watch games involving local amateur clubs. (He works during the week as a prison warden.) His territory includes the area between The Hague and Haarlem — “the flower district, which is also a very good hunting ground for players” is how he described it. He’ll observe a prospect for months or even years, and players he recommends will also be watched by one of the club’s paid scouts, a coach and sometimes the director of the Ajax youth academy. But for some families, the first time they realize their boys are under serious consideration is when a letter arrives from Ajax requesting that they bring their sons in for a closer look, an invitation that is almost never declined. To comprehend the impact of a summons from Ajax, imagine a baseball-crazed kid from, say, North Jersey arriving home from school one day to learn that he has been asked to come to Yankee Stadium to perform for the team brass. One player there was de Jong’s discovery, an 8-year-old who, he said, had “talent that is off the charts.” But if this boy were to be accepted into the academy, it would mean he had completed just the first of a succession of relentless challenges. Ajax puts young players into a competitive caldron, a culture of constant improvement in which they either survive and advance or are discarded. It is not what most would regard as a child-friendly environment, but it is one that sorts out the real prodigies — those capable of playing at an elite international level — from the merely gifted. About 200 players train at De Toekomst at any given time, from ages 7 to 19. (All are male; Ajax has no girls’ program.) Every year, some in each age group are told they cannot return the following year — they are said to have been “sent away” — and new prospects are enrolled in their place. And it is not just the children whose performances are assessed. Just before my second trip to Amsterdam in March, several longtime coaches were informed that they had not measured up and would be let go. One of them was the coach of a boy I had been following, Dylan Donaten Nieuwenhuys, a slightly built, soft-featured 15-year-old who began at Ajax when he was 7. LATE ONE AFTERNOON in the cafe at De Toekomst, I was talking with a coach, Patrick Landru, who works with the academy’s youngest age groups, when he asked if he could take my writing pad for a moment. I handed it over, and he put down five names, then drew a bracket to their right. Outside the bracket, he wrote, “80 million euros.” The names represented five active “Ajax educated” players, as he called them, all of whom entered the academy as children, made it through without being sent away and emerged as world-class players. Eighty million euros (or even more) is what Ajax got in return for selling the rights to the players to other professional clubs. Once a team pays this one-time transfer fee, it then negotiates a new, often very large, contract with the player. Wesley Sneijder, the first name on the list and probably the most accomplished young Dutch player at the moment, started at the academy when he was 7. At 23, Real Madrid acquired him for 27 million euros. (He now stars for Inter Milan, the current Italian champion and the winner of this year’s Champion’s League tournament, Europe’s highest club competition.) The other four players named on my pad were, like Sneijder, highly paid pros for clubs outside the Netherlands and prominent members of the Dutch national team that will compete in the World Cup beginning this week in South Africa. In the U.S., we think of money as corrupting sport, especially youth sport. At Ajax, it is clarifying. With the stakes so high — so much invested and the potential for so much in return — De Toekomst is a laboratory for turning young boys into high-impact performers in the world’s most popular game. Ajax makes mistakes, plenty of them. It sends the wrong boys away, and some of them become stars elsewhere with no compensation returning to the club. As a production line, it is grossly inefficient; only a small percentage of its youngsters become elite players. But the club does not throw money after pure fantasy, encouraging visions of pro careers that never have a chance of materializing for children who do not have the foundational talent to reach such goals. The club decides which boys have potential — “Please note,” its Web site advises, “Ajax’s youth academy cannot accept individual external applications” — and then exposes them to scientific training and constant pressure. The director of the Ajax youth academy is Jan Olde Riekerink, an intense man with piercing blue eyes who spends much of his day walking from field to field, observing. He usually stands in the background, out of sight, before coming forward to urge better effort or correct some fine point of technique. “He is always watching, like a spy,” Urvin Rooi told me. I told him that I was pretty sure that that is not the case. But it is no surprise that the rest of the world might be flummoxed — and come up with some offbeat theories — trying to explain why a nation as populous, prosperous and sports-loving as the United States still does not play at the level of the true superpowers of soccer. More than three million boys under age 18 play organized soccer in the U.S., but we have never produced a critical mass of elite performers to compete on equal terms with the world’s best. The American men are certainly improving. After finishing a surprising second to Brazil in last summer’s Confederations Cup, the U.S. qualified with relative ease to be among the 32 teams competing in the World Cup finals in South Africa, starting June 12 against England. Few would be surprised if the U.S. emerged from group play into the second round. But it would be a shocking, seismic upset if the Americans somehow leapt past traditional powers like Germany, Italy or Argentina — to say nothing of the favorites Brazil and Spain — to capture the championship. The other nation that shows up on any list of World Cup favorites is the Netherlands, a perennial contender widely considered to be the best team never to win the championship. Drawn from a nation of fewer than 17 million, with a core of stars who trained at Ajax, the Dutch national team plays in the Total Football tradition that relies on players who know what they want to do with the ball before it reaches them and can move it on without stopping it. The British author David Winner, in his book “Brilliant Orange: The Neurotic Genius of Dutch Soccer,” calls this approach “physical chess,” and the Dutch can be quite haughty about it. They abhor the cloying defensive tactics associated with the Italians and the boot-and-chase way the English played for years, and it has been observed that they sometimes appear more intensely interested in the artfulness of a match than in the result. In March, I had a seat at the Amsterdam Arena, just across the highway from De Toekomst, to watch the U.S. national team play the Dutch in a “friendly,” a pre-World Cup tuneup and test. Thanks to a late goal by the U.S., the final score was only 2-1, in favor of the Dutch, but the match was a version of that old playground game: it’s our ball, and you can’t play with it. The Dutch zipped it from player to player and from one side of the field to the other while the Americans ran and ran, chasing the ball but rarely gaining control. When the Americans did get the ball, their passes too often flew beyond reach or directly out of bounds. Other nations and professional clubs around the world play in a manner similar to the Dutch — including, not coincidentally, Barcelona, one of the most consistently successful clubs in Europe, and where Cruyff played after leaving Ajax and then coached for eight seasons. What this type of play demands is the highest order of individual skill: players with a wizardlike ability to control the ball with either foot, any part of the foot, and work it toward the goal through cramped spaces and barely perceptible lanes. After the U.S.-Netherlands friendly, the Dutch coach praised the Americans for having a “well-organized” defense — which was true but seemed to be a case, unintentional perhaps, of damning with faint praise. But what else could he say? The Americans did a good job of backing up and closing ranks, a survival tactic that, along with several heroic saves by the goalkeeper Tim Howard, kept the Dutch from running up six goals or so. That was only one game, of course, but it seemed to bring into focus what I had been observing at the Ajax youth academy, as well as learning about American soccer. How the U.S. develops its most promising young players is not just different from what the Netherlands and most elite soccer nations do — on fundamental levels, it is diametrically opposed. Americans like to put together teams, even at the Pee Wee level, that are meant to win. The best soccer-playing nations build individual players, ones with superior technical skills who later come together on teams the U.S. struggles to beat. In a way, it is a reversal of type. Americans tend to think of Europeans as collectivists and themselves as individualists. But in sports, it is the opposite. The Europeans build up the assets of individual players. Americans underdevelop the individual, although most of the volunteers who coach at the youngest level would not be cognizant of that. The U.S. diverges all the way to the last stages of a player’s development. In other places around the world, the late teenage years are a kind of finishing school, a period when elite players grow into their bodies, sharpen their technical ability and gain a more sophisticated understanding of game tactics. At the same time, they are engaged in a fierce competition to rise through the ranks of their clubs and reach the first team (the equivalent of being promoted from a minor-league baseball team to the big-league club). An elite American player of that age is still likely to be playing in college, which the rest of the soccer-playing world finds bizarre. He plays a short competitive season of three or four months. If he possesses anything approaching international-level talent, he probably has no peer on his team and rarely one on an opposing squad. He may not realize it at the time, but the game, in essence, is too easy for him. Of the 23 players chosen for the U.S. team going to the World Cup, 15 of them played at least some college soccer. Among the 8 who went straight into the professional ranks are several of the team’s most accomplished performers, including Landon Donovan, DaMarcus Beasley and Tim Howard, and promising players like Jozy Altidore and Michael Bradley (son of the head coach, Bob Bradley). Did they rise to the top of the American talent pool because they bypassed college? Or did they skip it because they were the rare Americans good enough as teenagers to attract legitimate professional opportunities? The answer is probably a little bit of both. But you will find no one in the soccer world who says they would have enhanced their careers by staying in school. Urvin Rooi’s son, Dylan, said that in his current training group of 15-year-olds, several new boys had been brought in for tryouts, and one had already been told he was accepted. It sounded like being in a workplace in which your possible replacement had already been installed at the next desk and given your identical tasks, to see if he could do them better. Dylan’s father is involved in a business that builds homes on the Dutch island Curaçao. His mother is a psychotherapist. It is not unusual for players at De Toekomst to come from middle- or even upper-middle-class backgrounds, and virtually none come from poverty in a nation where the standard of living is high and literacy is 99 percent. The demographics are not much different from the soccer-playing population in the United States, where most players still come from suburban comfort. In the Netherlands, though, youth players may end up with less education than their parents in order to pursue professional soccer careers, starting with a less-demanding high-school curriculum than they otherwise might take. Jennings acknowledged that, based on the methods pioneered by Ajax, top clubs all over Europe were scouting very young kids and enrolling them in their academies. A book published in 2009 by the British journalist Chris Green, “Every Boy’s Dream,” estimated that 10,000 were being trained by clubs in England. They are cheap investments for clubs wanting to scoop up every boy with even a remote chance of one day becoming a top footballer. There are two ways to become a world-class soccer player. One is to spend hours and hours in pickup games — in parks, streets, alleyways — on imperfect surfaces that, if mastered, can give a competitor an advantage when he finally graduates to groomed fields. This is the Brazilian way and also the model in much of the rest of South America, Central America and the soccer hotbeds of Africa. It is like baseball in the Dominican Republic. Children play all the time and on their own. The other way is the Ajax method. Scientific training. Attention to detail. Time spent touching the ball rather than playing a mindless number of organized games. The more thoughtful people involved in developing U.S. soccer talent know that we conform to neither model. We are a much larger nation, obviously, than the Netherlands. Our youth sports leagues, for the most part, are community-based and run by volunteers rather than professionals. They have grown organically, sending out tendrils that run deep and are difficult to uproot. Change at the elite levels is more possible than at the stubborn grass roots. Efforts to change American soccer culture are largely occurring in the older age groups. Some of the most talented players are being extracted from a deeply flawed system, but only after they’ve been immersed in it for many years. Najar, considered an exceptional talent, will very likely be the rare player to go from high school right onto an M.L.S. roster. But the decoupling of soccer education from higher education is an avowed goal of executives at the top levels of the American game. M.L.S. has been signing about a dozen young players a year — some from its teams’ academies, others who have already played a year or two in college — and putting them either on pro rosters or into development programs. (Under this setup, called Generation Adidas, money is put aside for players’ future college tuitions.) The academies of M.L.S. teams have begun to abandon the pay-for-play model and are bearing nearly all costs, including travel, for their players. Also, dozens of top amateur soccer clubs around the country have been designated by the U.S. Soccer Federation as academies, with the intent that they will offer training on a European-based model — more practices, fewer games, greater emphasis on technical skill. They have, however, already drawn criticism that their coaches can’t break an old habit: trying, first and foremost, to win rather than focusing on the stated goal of developing elite individual talent. The way we approach youth soccer in the U.S. is no more thoughtless than how we groom talent in baseball or basketball. All the same syndromes apply. Overplay. Too little practice. The courting of injuries — for example, the spate of elbow operations for pitchers in their midteens brought on by coaches who leave them on the mound for too many innings. The difference is that because these are, largely, our sports, we have a head start on the rest of the world and therefore a bigger margin for error. Ajax is a fulcrum of the worldwide soccer market, exporting top players to the world’s best clubs, because they take very young players and shape them. The U.S., by comparison, is still a peripheral participant. In the past decade, increasing numbers of Americans have gone overseas to play for European clubs, many of them signing contracts as teenagers. But with just a couple of exceptions, they are complementary players, not the star-quality performers who make up the rosters of the World Cup favorites. How much does it matter for the U.S. to ascend to the top rung of worldwide soccer and become a serious threat to win a World Cup? The effort itself would bring some welcome changes. Players whose training was paid for by professional clubs, rather than by their parents, would likely be treated as investments and therefore developed with more intelligence and care for their physical well-being. But club-financed training is the entry level to a rough-and-tumble, often merciless worldwide soccer economy. Elements of it clash with American sensibilities. What Ajax pioneered, and still executes at a high level, can look uncomfortably like the trafficking of child athletes. I met de Jong at the train station in Leiden, and we drove to a particularly well-heeled club called Quick Boys, in Katwijk. A spacious locker-room complex with a private club on top had been built with funds from benefactors connected with the tulip industry and local fishing interests. The bar in the private club was an elaborate wooden sculpture shaped like a herring boat. I couldn’t tell for sure, but it seemed to me that the guy, Délano van der Heyden, born in September 2004, might actually be small even for a 5-year-old. The ball at his feet came up almost to his knees. He was “playing up,” competing against boys as old as 9. When the game started, he was exactly as advertised: remarkable. Délano kept up with the other boys, a few of whom fell on contact and had to be attended by coaches, which he never did. He showed the ability to kick with either foot. He could receive the ball with his back to his offensive end and turn, with the ball still in his control, and head toward the goal. Even if Délano turned out to be a world-class prodigy, it would be at least a dozen years before he could play for Ajax’s first team. He could not even enter De Toekomst for another two years. But I understood de Jong’s interest. Délano was well worth this investment of time and attention, because one day he might be sold to Chelsea or Real Madrid or Juventus for millions. Michael Sokolove, a contributing writer for the magazine, is the author of “Warrior Girls,” about the injury epidemic among young female athletes. [Video] Do Americans Really Love Soccer?